Estepona se ha convertido en un lugar atractivo desarrollado con un sinnúmero de oportunidades para la recreación, de vacaciones en la playa, rutas de viaje a hacer turismo, golf, etc .. Sobre todo en invierno recomendado o como una ubicación para explorar Andalucía. Las vistas desde la terraza son increibles. Sabine y Richard nos ayudaron en todo momento con nuestras dudas y fueron muy amables a lo largo de la estancia. La casa es perfecta para pasar unos días en la playa o en la piscina. Excellent, well furnished apartment in a great position in Estepona, with fine views to the sea. Our holiday was wonderful from the start, when we were met by Richard who welcomed us, showed us around the apartment, and gave us helpful information on Estepona. The apartment is in an excellent, quiet location with a very good supermarket close by, and only a short walk to the port, the beach, and all the excellent cafes, bars and restaurants, offering a huge choice for eating out. The apartment is very comfortable ,spotlessly clean, very well equipped with all the modern kitchen equipment needed for a self catering holiday, excellent air conditioning and international TV. The terrace is spacious with table and chairs, has fabulous views to the sea and beyond, and is ideal for an evening refreshment before heading out for dinner. The gated pool area is very well tended, and the pool is large and welcoming. 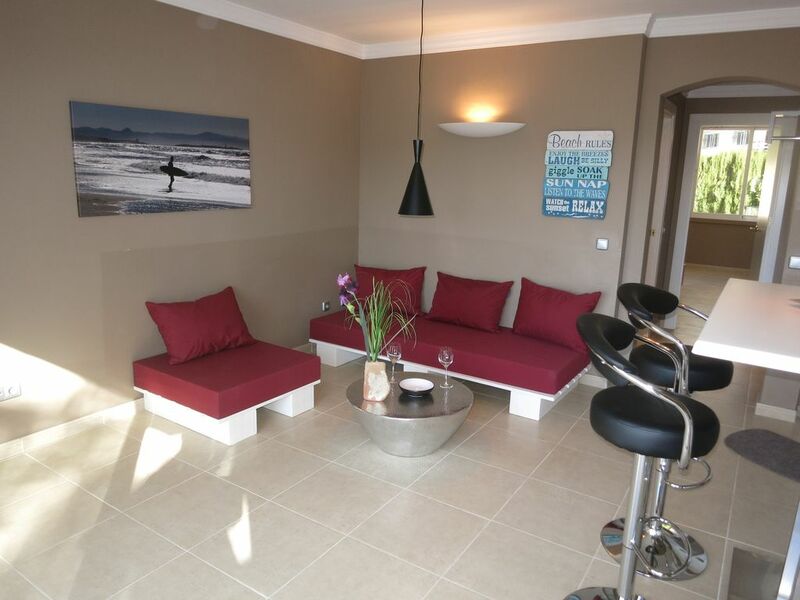 We would highly recommend this apartment for a great all round holiday. Apartment is lovely and very well equipped. Location is good and very convenient to the Marina and the El Christo beach . The old town is approximately a 25 minute walk where there are some nice bars and restaurants- can recommend Siopa for gin and El Rincon Toscana and Casa del Rey for food. The old town is very quaint with cobbled streets and flowers. Richard was an excellent host and I would highly recommend this apartment. Wir hatten einen angenehmen Aufenthalt. Die Wohnung war schön sauber und geschmackvoll eingerichtet. Die Übergabe mit den Vermietern hat auch super und flexibel funktioniert. Die Wohnung ist sehr gut ausgestattet, insbesondere der vorhandenen Sonnenschirm war super. Können die Wohnung vorbehaltslos weiterempfehlen. This flat is as advertised and is good value. It's clean, modern, quiet and in an excellent location. A short walk puts you near the marina where there are a number of quality cafe's and restaurants. The area is clean, well kept & safe. Sabine was great help with planning, recommending Malaga Shuttle Bus to for transportation to and from the airport, and communications with her was prompt and professional. We would definitely stay here again. Der Balkon ging zur großen Straße raus, also Verkehrslärm. Im Schlafzimmer war es ruhig, da das Zimmer zur anderen Seite lag. Begrenzte Parksituation, selbst in der Nebensaison. Im Hafen waren genügend Restaurants vorhanden, aber viele Italiener und Asiaten. Leider haben Sie die Anzeige nicht gelesen und auch die Bilder und die Lage nicht studiert . Durch ein Unwetter waren kurzzeitig weniger Parkplätze .Es gibt ausser im Hochsommer immer super Parkmöglichkeiten !! Modernes Ambiente ist nun mal nicht jedermanns Sache .Wir finden es nicht ok unsere perfekt dargestellte Wohnung . anzumieten um danach nur rumzumeckern ! Schon Ihre Reaktion nach dem Öffnen der Türe liess nichts Gutes erahnen trotzdem blieben wir freundlich . In anderen Foren haben wir 5 Sterne und die haben wir auch verdient . Gediegenes deutsches gutbürgerliches Ambiente ist definiivt besser für Sie . Die Wohnung roch nach Ihrem Aufenthalt stark nach Alkohohl .Bei der Strasse handelt es sich um eine verkehrsberuhigte Tempo 30-Zone . Recientemente renovado apartamento con piscina, pista de tenis, un bonito balcón, el aire acondicionado silencioso para la calefacción o la refrigeración, Internet ADSL, televisión internacional, etc. Incluso grandes viajes en barco se pueden hacer directamente desde el puerto. Vivimos cerca y le ayudamos con consejos sobre.